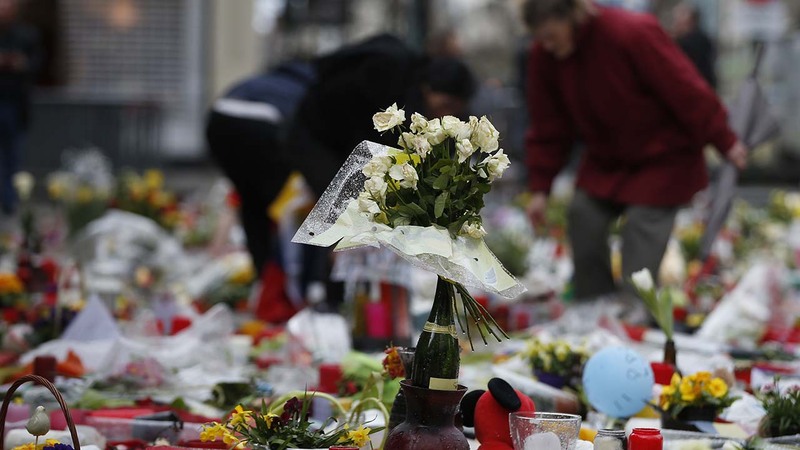 BRUSSELS -- The Belgian health minister says four of those wounded in the suicide bombings last week have died in the hospital, bringing the number of victims of the bombings to 35. The minister, Maggie De Block, made the announcement on her Twitter account Monday morning. She posted: "Four patients deceased in hospital. Medical teams did all possible. Total victims: 35. Courage to all the families." Suicide bombers hit Brussels Airport and a city subway train on March 22 in an attack claimed by the Islamic State group. The website of Belgium's Federal Police on Monday began carrying a 32-second video of a mysterious man in a hat suspected of having taking part in the March 22 bombing of Brussels Airport. "The police are seeking to identify this man," the site says. The implication is that the suspected accomplice of the two airport suicide bombers could still be at large. Last week, Belgian media reported that Faycal Cheffou - reported to be the man identified by authorities as Faycal C. who is in custody and has been charged with terror offenses - had been identified as the suspect who escaped from Brussels Airport following the bombing. The video shows the man, wearing glasses and a white jacket, wheeling a baggage cart through the airport along with the two men identified by Belgian authorities as the bombers. Police did not add anything, and did not say why they had released the video.